Fresh Dexter Season 8 news! 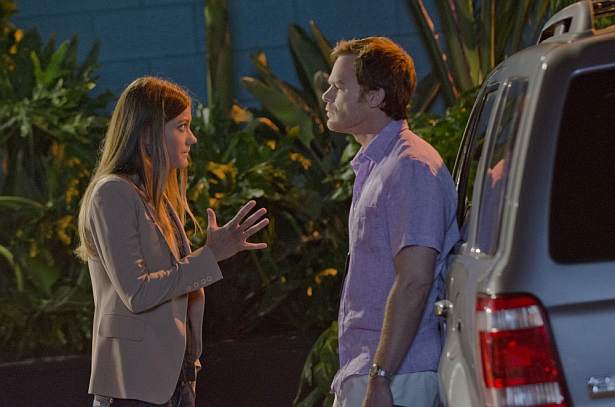 It looks like Dexter and Deb are in trouble. Hit the 'read more' button to for some info about to new major recurring characters for the next season! TVLine reports: The Showtime thriller will introduce two major recurring characters in its upcoming eighth and likely final season — and both could spell trouble for Dex and Deb. First up is Dr. Evelyn Vogel, a formidable and whip smart neuro-psychiatrist in her late 50s who assists the law in profiling criminals (like, perhaps, the one who murdered LaGuerta?). The show is also on the hunt for a 40ish actor to play Jacob Elroy, a handsome and straightforward former cop who now owns his own private eye business. Our guess: Angel (or maybe Tom?) hires him to find out who killed his ex-wife. What do you guys think? Sound off in the comment section!